Many have seen the latest Raptor design and found themselves mesmerized by its military-grade, aluminum alloy construction. 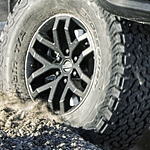 With BF Goodrich All-Terrain KO2 tires, the Raptor is designed to take you on off-road adventures while also handling highways with ease. You’ll love the pick-up-and-go acceleration with 450 horsepower from the twin turbo V6 engine. While previous Raptor models included a V8, the latest version has an EcoBoost style. You can also upgrade several other features of the Raptor, including the suspension. You can upgrade to the FOX Racing Suspension for effortless maneuvering around gravel roads and race trucks. That’s exactly what Raptor feels like when you press down on the accelerator. You’ll instantly feel like you’re in a sports car, despite having a comfortable cabin and cargo bed. Want to take a test drive with the F-150 Raptor? You can experience the power and acceleration when you stop by Ray Price Ford.